Most of us often detest the amount of control our parents exert over our lives during our younger days, as their lectures are more often than not littered with “do nots” rather than “go ahead”. We think that they are old-fashioned and do not understand why a young person requires the amount of freedom to hang out with one’s friends until the wee hours of the morning. Thankfully, karma has a way of placing us in our parents’ shoes when we ourselves behold a bundle of joy in our arms, promising to take good care of our kid, forming a list of “do nots” in our minds already. This is where the OnGuard Kids Personal Safety Alert watch comes in handy as you cannot be around your kid all the time. The OnGuard Kids Personal Safety Alert works great in getting the attention of anyone within hearing range of it’s 110-decibel emergency alarm that can be activated by the kid whenever he/she is approached by a stranger who offers more than candy, or is lost in a mall, injured, or even when cornered in the playground by a bully. 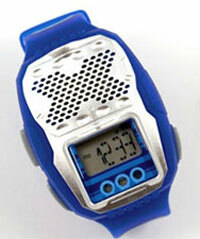 It works great for both boys and girls as the watch comes with an attachable flashlight and interchangeable faceplates. The kids will have to be taught not to abuse the alarm though, and use it only in times of real emergencies. Each purchase comes with a DVD that teaches the child how to use the watch. We strongly recommend that you pick up the OnGuard Kids Personal Safety Alert only for pre-teens, as teenagers will find this timepiece “uncool” and cheap with the $39.95 price tag.